The very first time I heard about this book, it made it onto my Goodreads "want to read" list. It instantly intrigued me & when I found a 'Bargain Priced' copy at my local bookstore, I knew I had to grab a copy to add to my bookshelf at home. Sadly though, that copy sat on my shelf for almost a year. Maybe it was the length that intimidated me. Who knows? I just know that every time I was ready for a new book, I looked over my shelf & thought "I really want to read this one," but in the end, I always skipped over it..... Until a couple weeks ago. That's right, I started and finished this massive book in about 2 weeks! For some readers this may seem like a given but in my case, it's very rare. Due to the fact that I tend to only 'make time' to read in the car rider line when I go to pick up the littles. 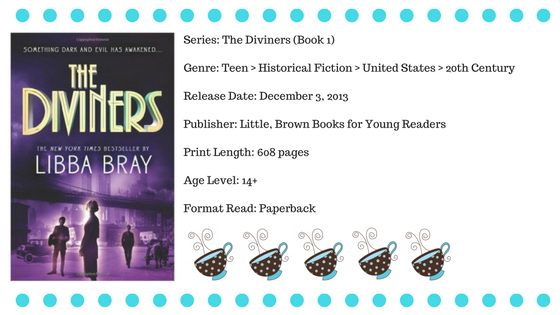 The Diviners (characters & plot) consumed me. I was reading every free chance I had. I just had to know what was going to happen next. Never once was I let down or disappointed. It may have taken me a while to pick this book up but I can now say that I picked the perfect time of year to read it. The timing in the book, as well as the time of year, match perfectly with this Fall season. If you've been looking for a good book to read this Fall, or Halloween season, definitely pick this one up.